Is It Obvious To Your First Time Visitors What Your Blog Is About? The Edublog Awards is a great way of discovering new blogs, cool ideas and resources that can be helpful to our teaching. And people are currently visiting the nominated sites for exactly this reason! Trouble is it’s often hard to quickly work out what a site’s about when visiting it for the first time. This needs to be really obvious for first time readers because they have limited time! So here’s some tips to make it easier for your first time readers. A short blurb in a text widget in your blog sidebar is an excellent way of providing a quick overview of what you’re and/or your site is about. Ideally it should be short, to the point and placed at the top of your blog sidebar where it’s one of the first thing visitors see. 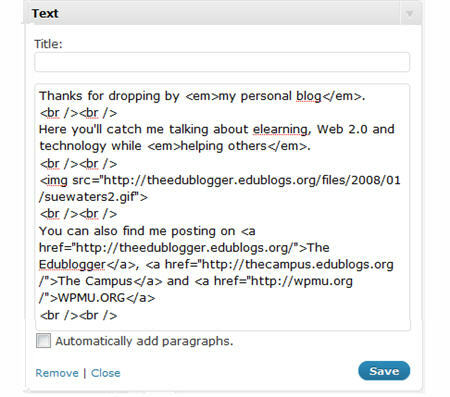 For Edublog and WordPress blogs you’ll need to use HTML for better formating of your text. Below is the HTML code I use in the text widget on my personal blog. An About page is where readers find out more about you and your blog. Readers often use it to decide whether to bother subscribing to a blog. When you set up a new Edublogs or WordPress blog it automatically comes set up with an ‘About page’. Readers access this page by clicking on About in the page links at the top of your theme or in the link in your sidebar. or add a About Page link using a Blogger Template as Sarah Stewart’s done. Writing a good ‘About Page’ is hard. What’s written on an ‘About page’ and the types of details included is influenced by the type of blog and the intended readers. Next tell them about your blog and the reasons why you blog. Not too long, not too short, include photos that help readers relate to you as a person. What country, state and city you are from? Voting is now open and ends USA EST 11.59 PM Wednesday 16 December! – PLEASE click here to visit TimeandDate.com to check the time voting finishes your local time! Winners announced at Awards Ceremony USA EST: 7 pm, Thursday 17 December – PLEASE click here to visit TimeandDate.com to check your local time! 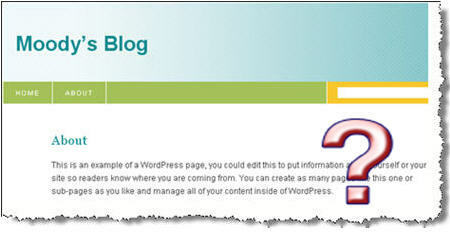 @Mike Glad my post prompted you to add the text widget to your blog sidebar. This and an about page make it so much easier for first time readers to work out what your blog is about and if they are likely to find the information they need on your blog.